For the first time in 20 years, growth of the global wind power market faltered, stumbling by 5.8% to 35.7 GW in 2010 (37.9 GW in 2009). The North American market has taken a knock and the European market has slowed down. On the other hand Asian market growth has crept up steadily and now has a grip on more than half the global market. The photovoltaic sector is continuing on track, just as the extent of solar energy’s electricity-generating potential is dawning on the public mind. The annual global installation figure was up more than twofold in 2010 (rising from just short of 7 000 MWp in 2009). It leapt to over 16 000 MWp, bringing worldwide installed photovoltaic capacity close to 38000 MWp. As could be expected, the recession cast long shadows over the European solar thermal market throughout 2010. For the second year running, new installations for hot water production and space heating (collectors) decreased. According to the EurObserv’ER survey the newly-assigned surface area was 3.8 million m2 in 2010, down from 4.2 million m2 in 2009 and 4.6 million m2 in 2008. 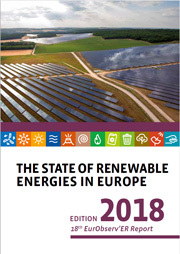 At the same time, the European high-temperature solar sector related to electricity production has been taking shape alongside the heat-producing applications, with 638.4 MW already installed. Spain accounts for almost all of this capacity, and a further five EU countries, mostly Mediterranean, intend to develop the sector. In 2010 biofuel continued to gnaw away at petrol and diesel consumption in the European Union. However its pace backs the assertion that EU biofuel consumption growth slackened off. In the transport sector, it increased by only 1.7 Mtoe compared to 2.7 Mtoe in 2009. 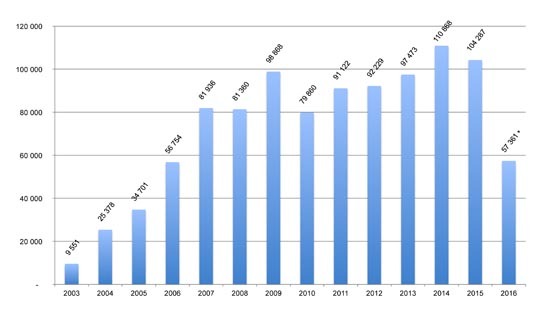 The final total biofuel consumption figure for 2010 should hover at around 13,9 Mtoe. The double whammy dealt by the economic crisis and housing slump has stifled expansion of the ground-source heat pump market in many European countries. The European Union market contracted for the second year running (by 2.9% between 2009 and 2010), and this despite the fact that more than 100 000 units were sold over the twelve-month period, taking the number of installed units past the one million mark. The european Union Member states’ political resolve to develop the energy potential of solid biomass has started to pay off, as in 2010 there were clear signs that growth of primary energy production had quickened pace. The output figure rose to 79.3 Mtoe in 2010, which is 8% up on 2009 and deserves comparison with the previous year’s 4% rise (from 70.6 Mtoe in 2008). The trend, which was driven deeper by europe’s particularly cold winter of 2009-2010, demonstrates that the economic downturn failed to scuttle the Member states’ efforts to structure the solid biomass sector. 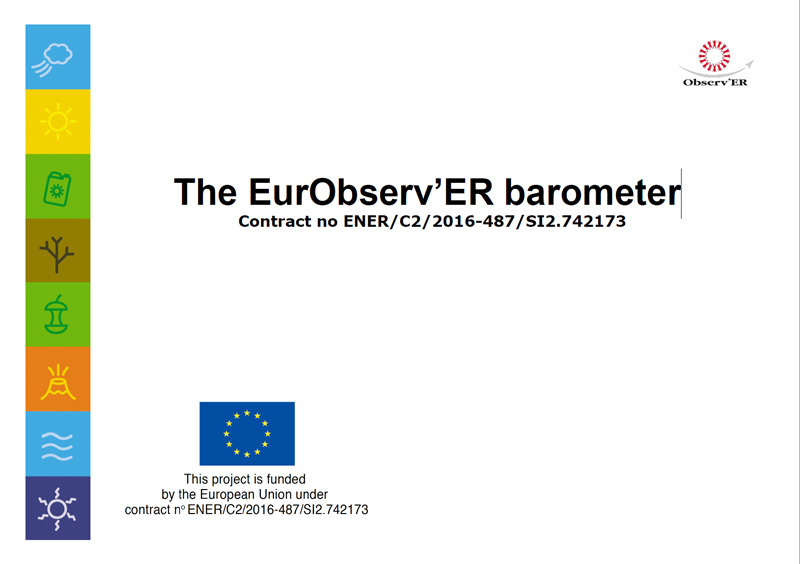 For over ten years now, EurObserv’ER has been collecting data on European Union renewable energy sources to describe the state and thrust of the various sectors in its thematic barometers. 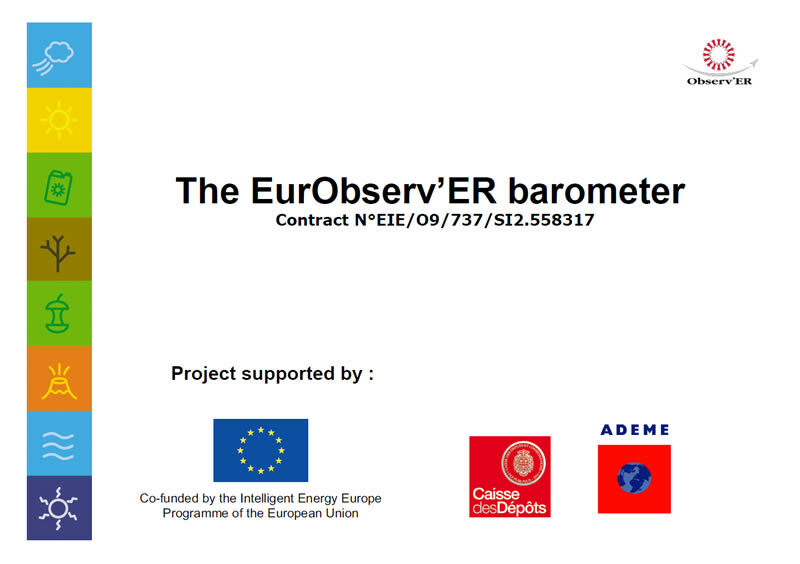 The first part of this assessment is an updated and completed summary of the work published in 2011 in Systèmes Solaires (Journal des Énergies Renouvelables nos. 203, 204, 205 and 206, Journal de l’Éolien no. 8 and Journal du Photovoltaïque no.5). It provides a complete overview of the ten renewable sectors, supplemented by two summary notes on concentrated solar power and ocean energies. Their performances are compared against the 2020 targets of the European Commission directive and the Renewable Energy National Action Plan targets. This edition also provides a monitoring of socio-economic indicators (employment and turnover) for all sectors and for the 27 countries of the European Union. This 11th edition includes a new chapter with seven regional cases that have succeeded in attracting private investments in their territories to develop projects based on renewable technologies.